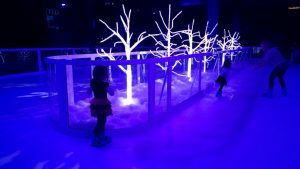 So ever since we took my daughter to see Disney on Ice when she was two years old, she has been OBSESSED with wanting to go ice skating. We waited a year and when she was three, decided we would let her give it a whirl. 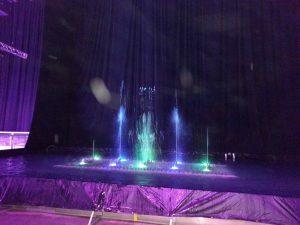 The Enchanted Ice seemed like the perfect place. It’s not actually ice, in fact. It’s some weird slippery plastic material. Why is this awesome for children? Because when they fall, they won’t get cold or wet. It’s also quite warm in there so you don’t need to bundle up for your time on the ice. 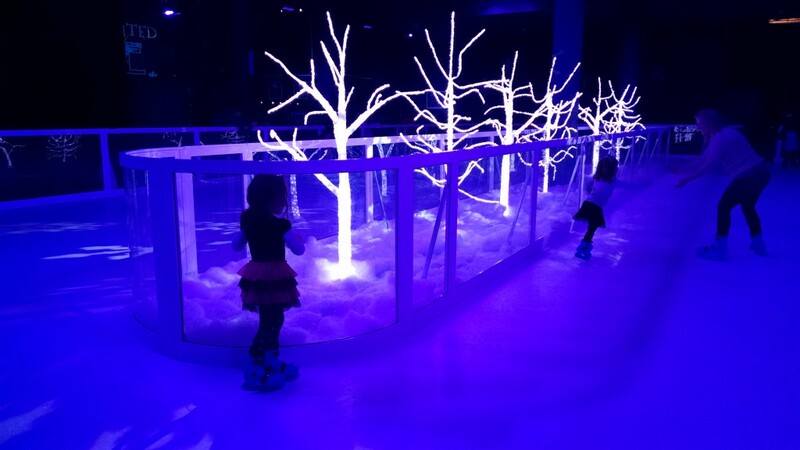 Its a mere $5 to get skates and admission on the ice. Cant beat that! 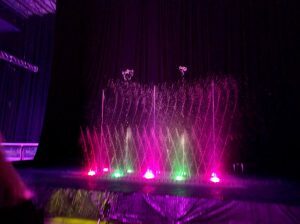 They also make it a fun experience piping in holiday music and colored lights. Also great since most three year olds have an attention span of 10 minutes when trying something new. So we gave it a go! So here’s our honest experience. My daughter was PSYCHED! We put on her ice skates, took a photo to commemorate her first time, walked on over to the ice, and then she chickened out. Yup that’s right folks. Wouldn’t even step foot on the ice after talking about it for a year! I carried her into the rink to show her it wasn’t scary but she was still terrified. So what did we do? The nice people at Jordan’s Furniture gave us our $5 back and I had the time of my life skating around the rink alone, showing the kids how much fun it was. Lucky for us, I don’t think we traumatized her too much since she has been asking every day since to go ice skating again. Maybe now that she’s 4, we will give it another go. Stay tuned! 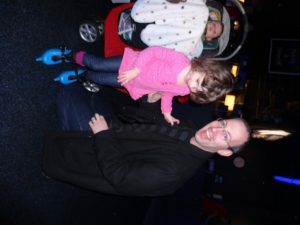 As a side note – there were two year olds out there with me! So she was definitely not too young. For those of you with older kids, there were teenagers as well. 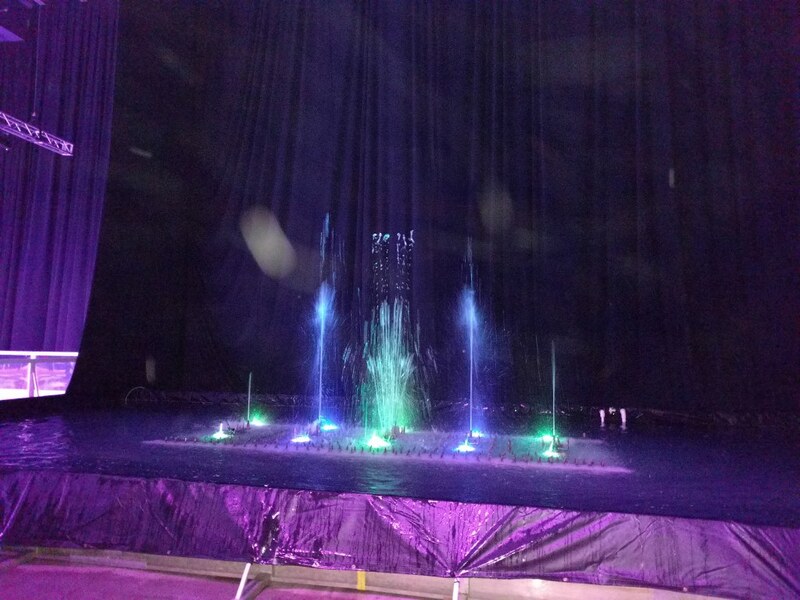 For those of you who are professional figure skaters – don’t waste your money. No toe picks or triple axles here. 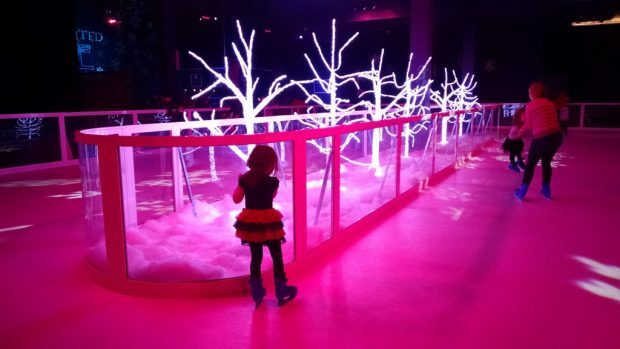 UPDATE: We took four year old Sophie and she had “the best day ever.” She got right onto the (plastic) ice and went skating around on her own. 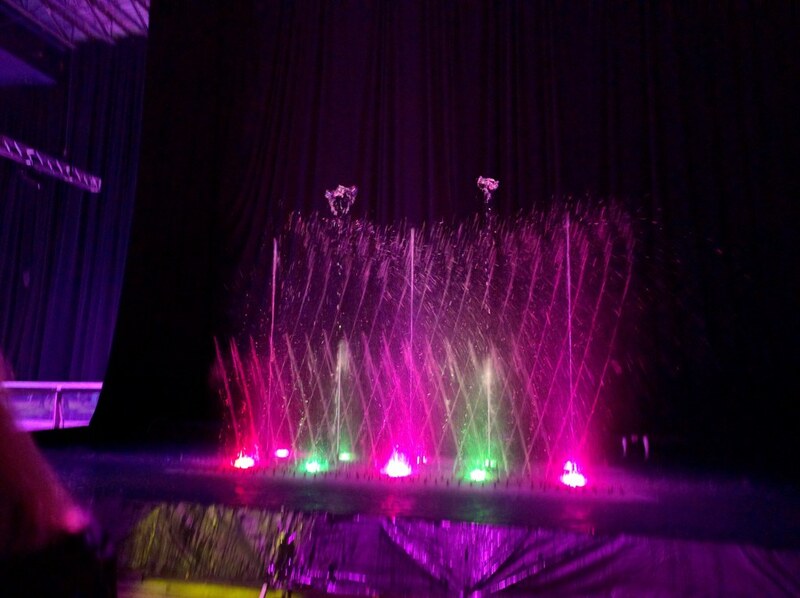 They also had a new colored water show that danced to music for those not skating. It’s inside the Clearance area behind the Enchanted Village. So you either have to go through the village or through the entire store to get there.